Fast and professional dryer repair in Walnut Creek - HIGHLY RATED! We do washer or dryer repair in your area. 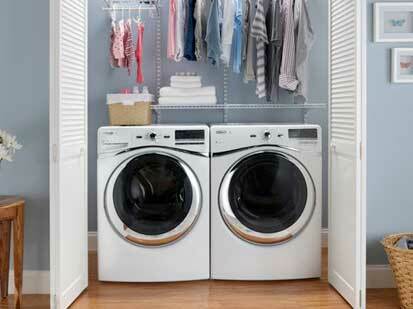 In fact, we are dryer repair in Walnut Creek experts. We work on all brands and models of dryers. For example Asko, Bertazonni, Bosch, Dacor, DCS, Electrolux, Fisher&Paykel, Frigidaire, GE, Jenn-Air, KitchenAid, La Cornue, LG, Liebherr, Marvel, Miele, Perlick, Samsung, Siemens, Sub-Zero, Thermador, Traulsen, True, Viking, Whirlpool, Wolf and many others. If your dryer is making noises, will not start or heat properly, we can help. Our team is factory trained and certified. That means that they know exactly the fast and most convenient way to fix your broken dryer. Our company has a lot of experience in all aspects of appliance repair and dryer repair in Walnut Creek in particular. We have been doing this work for more than 30 years and deal with both commercial and residential clients. No project is too big for us. We quickly figure out what is wrong with your dryer, find the right parts for it and will professionally install them. Our experience will help us to make sure that everything is installed correctly and that your dryer will stay functional for a long time to come. Give us a call, and we guarantee that your dryer will be working as good as new. For best dryer repair in Walnut Creek call us at 925.265.7782 or fill out our short contact form. Our customer service representative will quickly schedule a convenient appointment for you. One of our best appliance repair specialists will be dispatched to help you with your problem. He will make sure to bring all the tools, equipment and even majority of parts to your dryer repair in Walnut Creek appointment. As soon as he gets to your residence, our tech will get to work. He will take apart your dryer and will clean it out. He will make sure that motor is good and all the other parts are functioning well. Some of the problems he can fix right away while other problems may require parts replacement. Why pick us to do dryer repair in Walnut Creek for you? When it comes to dryer repair in Walnut Creek, we are simply number one. Our company has more than 30 years experience in appliance repair. Our technicians are all factory trained and certified. We work on all brands and models of dryers and often take on jobs that other companies can not handle. Our tech will tell you right away if your older dryer is worth saving. Our work is fast, precise and reasonable priced. You get help from industry professionals and all the assistance and advice necessary to make sure your kitchen and laundry is always in the best shape possible. With us, you get help from industry professionals and all the assistance and advice necessary to make sure your kitchen and laundry is always in the best shape possible. We are expert in all appliance repair in Walnut Creek including refrigerator repair, washer repair, dryer repair, dishwasher repair, stove and range repair, oven repair, steam oven repair, microwave repair, freezer repair, ice maker repair, barbecue repair, pizza oven repair, patio heater repair and much more. With many locations all through out Southern and Northern California you can be sure that help is on the way fast. For dryer repair in Walnut Creek, please call us at 925.265.7782 or you can fill out our short contact form. We would love to talk to you and answer all of your questions. Customer satisfaction is guaranteed! We appliance repair in East Bay including Alameda, Alameda County, Antioch, Berkley, Brentwood, Clayton, Concord, Contra Costa, Contra Costa County, Danville, Discovery Bay, Dublin, East Bay, Hayward, Lafayette, Livermore, Oakland, Oakley, Orinda, Piedmont, Pittsburg, Pleasanton, San Leandro, San Ramon, Santa Clara County and Sunnyvale. We do washer or dryer repair in your area. In fact, we are dryer repair in Walnut Creek experts. We work on all brands and models of dryers. For example Asko, Bertazonni, Bosch, Dacor, DCS, Electrolux, Fisher&Paykel, Frigidaire, GE, Jenn-Air, KitchenAid, La Cornue, LG, Liebherr, Marvel, Miele, Perlick, Samsung, Siemens, Sub-Zero, Thermador, Traulsen, True, Viking, Whirlpool, Wolf and many others.